This lovely Amish Poly 8' Golden Gate Table features 8 Bridgeport Arm Chairs to serve and seat all of your outdoor party guests. 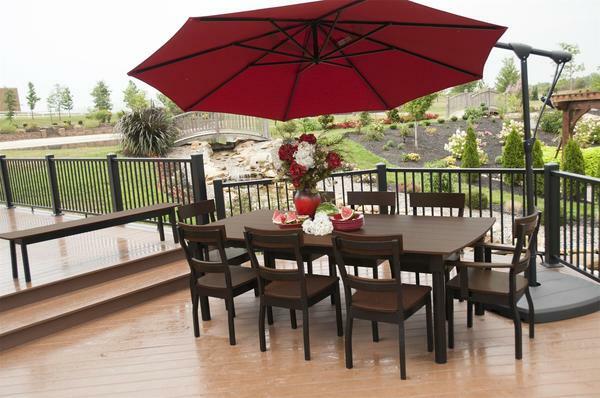 This fantastic outdoor dining set is made with tough, sustainable poly lumber, meaning your outdoor table and arm chairs will last years of outdoor use. Select your own color and optional umbrella for total customization. We can not guarantee poly colors will match when combining different pieces from different collections. We strongly advise combining products from the same collection to ensure an accurate color match and finish.